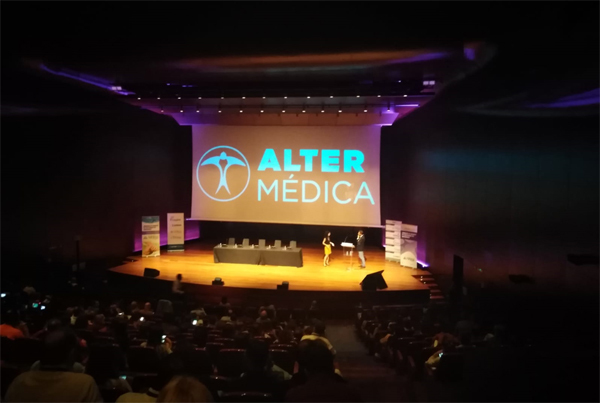 On 20th October, Alter Médica organised the "3rd Congress on Alzheimer's Disease and Movement Disorders", at the Reina Sofia Museum, Madrid, which was attended by 220 Neurology and Geriatrics specialists from all over the country. Coordinated by Dr. Joaquín Ojeda and Dr. Gerardo Gutierrez, neurologists at Hospital Infanta Sofia in San Sebastian de los Reyes (Madrid) and the Neurorecordings Platform, the Congress focused on the review of current issues concerning these pathologies. Participants stressed the high quality of the scientific programme, attended by top-level speakers such as Dr. A. Linera and Dr. M. Mata, from Hospital Ruber Internacional, Dr. A. Alonso and Dr. I. Pareés, from Hospital Ramón y Cajal (Madrid), Dr. F. Moreno, from Hospital de San Sebastián, Dr. A. Sánchez Ferro, from CINAC (Móstoles), and Dr. L Montolliú, from Centro Superior de Investigaciones Científicas. This 3rd Congress provides continuity of the other ones organised by Alter Médica in 2016 (Valencia) and 2017 (Madrid), and they reflect the Alter Group’s commitment to collaborate in training activities for specialists who treat prevalent pathologies such as Alzheimer’s and Parkinson’s diseases. We organised an international competition in collaboration with the UNESCO’s Cultural Landscapes and Heritage Chair to integrate our winery in Laguardia into the Rioja natural and cultural landscape. With the initiative, the façade and exterior of the winery facilities, situated at the foot of the medieval town of Laguardia and which are an example of typical 1970s industrial architecture, will be renovated. The deadline for the submission of proposals is 29th May. The creative intervention will take place during the summer and is expected to be completed in the autumn. An international jury of great prestige in the academic, landscape, artistic and cultural fields will evaluate and choose the final project from those submitted by a selection of guest landscaping, architecture and design colleges and universities. Among others, it will be formed by Petra Blaisse from the Dutch studio Inside Outside; the renowned Australian muralist Guido Van Helten, who already transformed our Espacio Medio Millón; Manuel Gallego, National Architecture Award 2008; Joaquim Sabaté Bel, architect and economist specialised in cultural landscape; and José González-Cebrián, former director of A Coruña Higher Technical School of Architecture and former municipal architect of this city. On Thursday 7th June, the jury will visit the region of Rioja Alavesa, Laguardia and Bodegas Solar de Samaniego. The winning proposal will be chosen during a session of discussion and reflection held in the Winery. Durón Reserva, with the D.O. Ribera del Duero seal, has achieved the highest recognition at the latest editions of two of the major international wine competitions. Durón Reserva 2010 has been awarded Gold Medal at Challenge International du Vin 2018, the biggest wine competition organised in France, and the International Wine and Spirit Competition (IWSC) 2018, regarded as the benchmark and most influential wine competition in the world. The winning wine, of which 42,000 bottles have been produced, is made with local red grapes (Tempranillo) and Cabernet Sauvignon from the Bodegas Durón vineyards which grow in the heart of Ribera del Duero, from where it gets all its character. This week we have received the Certificate of Excellence awarded by TripAdvisor that distinguishes the good reviews given and the top service quality of our Bodegas Solar de Samaniego. More information and visits to Bodegas Solar de Samaniego, on our website or by calling 945 943 629.